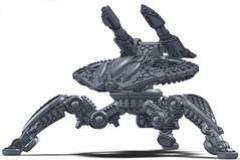 The Birdeater is an anti-air variant of the Tarantula, armed with the familiar and lethal twin ion-cannon. It often employs its climbing abilities to gain a commanding view of the battlefield - a highly useful ability for an anti-air unit! Since it is less agile than the Kukri, it is better suited to more static defensive roles, where its superior survivability makes it a favorite of the Shaltari Warchiefs who favor heavier units.